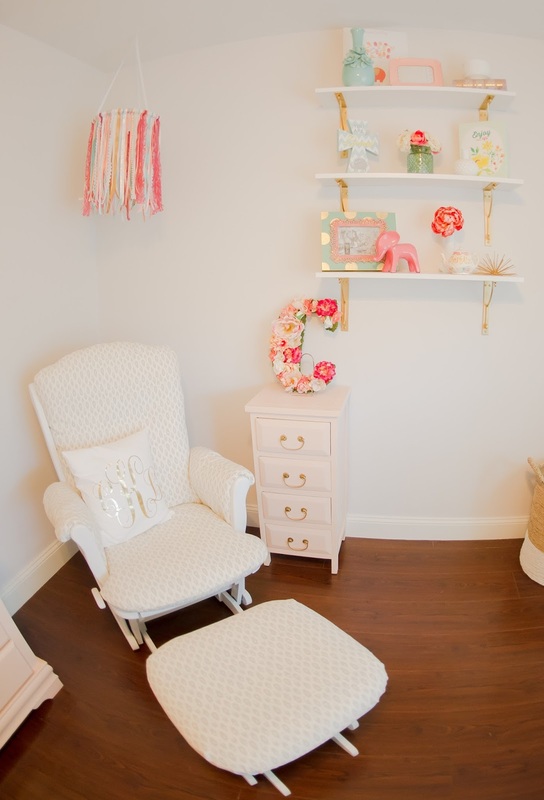 My sweet Charlotte's nursery was a project of love! 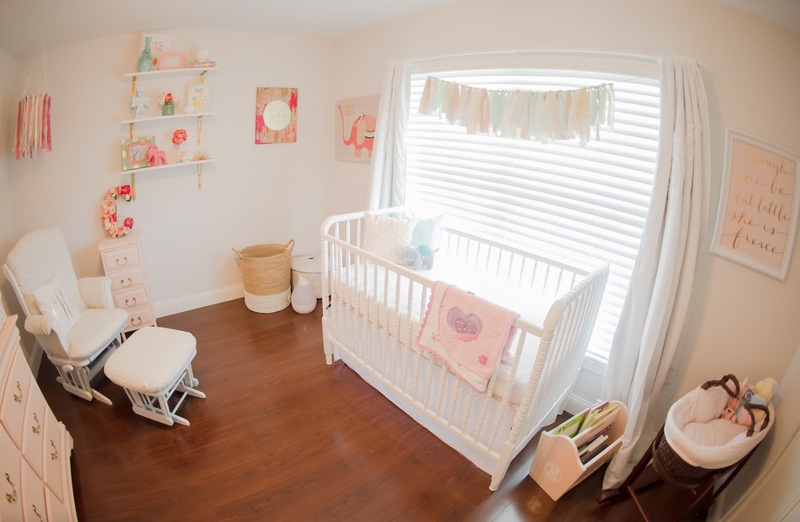 I had a fairly limited budget for her nursery (hellooo, second child!) but I still wanted to create a beautiful space. I purchased a few things, rehabbed some older pieces and got crafty for the rest! 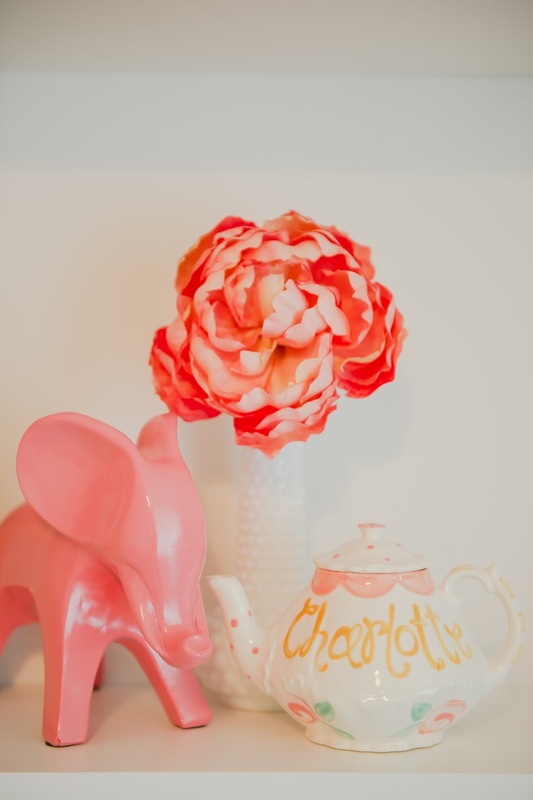 When planning Charlotte's nursery, I knew that I wanted her room to be bright and whimsical. I was drawn to mint, blush and of course, gold! I also wanted prints that communicated strength, determination, beauty and our love for Jesus. Although she was a super relaxed baby when I was pregnant, Charlotte is truly my wild child! Her energy matches the room we designed for her! 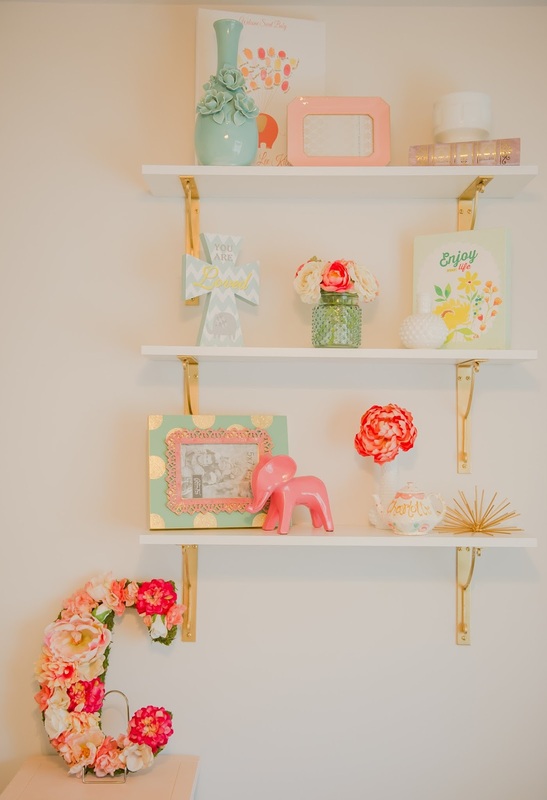 Here are some pictures of her mint, blush and gold, "wild & free" nursery. Sources/project information included! We purchased the crib here for $199! The book holder is from a thrift store, then was painted and I added a monogram decal. The Moses basket is an RH baby hand me down from Avery! The white and rattan hamper was a find from Home Goods - I think it is technically just a storage bin, but it worked perfectly for her hamper! Gold Monogram Pillow // Dutaillier Glider (recovered in Nate Berkus for Joanns fabric, no exact match online, but I love this one) // Ikea shelves with braces spray painted gold The night stand was a piece from our old guest bedroom and was painted a light peach color. I made the flower covered "C" and the hanging mobile! Both were super easy projects! I found the wooden "C" from Hobby Lobby and covered it with Hobby Lobby green moss. I then hot glued on faux flowers that matched the colors of the room. In order to get it to stand up, I had to use this kind of picture stand. The mobile was also super easy! I took the inside ring of an embroidery hoop, and tied several different types of ribbon around it until the wood was completely covered. Then I tied three longer strings equidistant from one another, and gathered them in the middle to secure it to the ceiling. 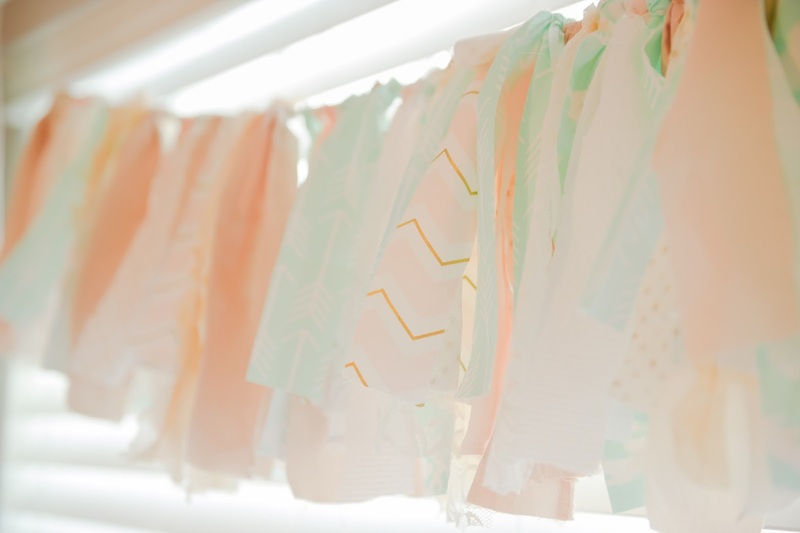 If you are looking for a cute non-DIY mobile...this one by BlaBla was top of my list! 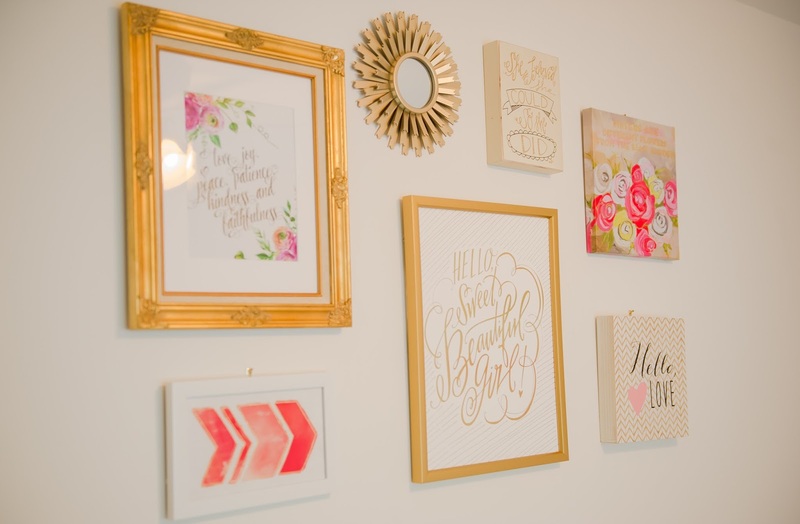 The gallery wall prints came from Hobby Lobby, Francescas, Target & Etsy (Fruit of the Spirit Print here) I got all of the shelf styling pieces from Hobby Lobby, my baby shower or vintage stores! I love the color this rough edge fabric banner brings to the room! 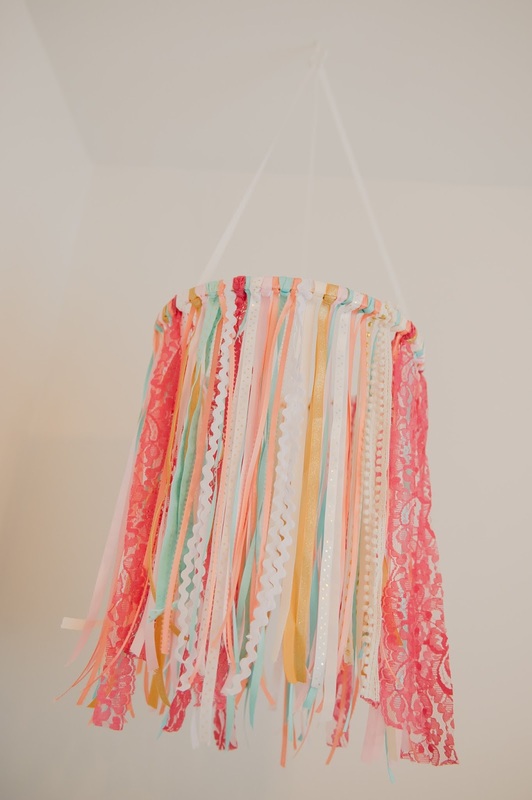 This is one of the easiest DIY projects because you just tie fabric strips (however wide you want them to be), to a string, and then hang!